Haryana Housing Board has given a notification for the recruitment of 05 Chief Revenue Officer, Revenue Officer, Junior Engineer (Civil), JE (Elect.) and Accountant vacancies on the contract basis. The interested candidates can attend walk-in-interview for Housing Board Haryana Recruitment 2019 on the due dates. 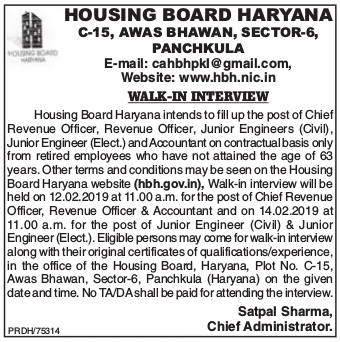 Haryana Housing Board Recruitment 2019-20 notification is out. As per the Notification, there are 05 Chief Revenue Officer, Revenue Officer, Junior Engineer (Civil), JE (Elect.) and Accountant vacancies. The educational qualification is different for each post. The maximum age limit for HBH Vacancy is 63 years. If you are looking for Jobs in Haryana Housing Board then this article is only for you. Chief Revenue Officer Retired Class-2 Officer, having a degree in law (professional). Preference will be given to the retired employees of the Revenue department/housing board. Revenue Officer The retired employee having a degree in law (professional). Preference will be given to the retired employees of the Revenue department/housing board. Junior Engineer (Electrical) Retired Jr. Engineer (Electrical). Junior Engineer (Civil) Retired Jr Engineer (Civil). The candidate should not have attained the age of 63 years as on the last date of application. The eligible candidates can attend walk-in-interview along with their original qualification/experience certificates in the office of Housing Board Haryana, C-15, Awas Bhawan, Sector-06, Panchkula (Haryana) on or before the due date. You can check the Haryana Housing Board Result and Interview List through the official website. Date of Interview: 12 February for the post of Chief Revenue Officer, Revenue Officer, and Accountant and 14 February for the other posts.